With heaps of world-class golf courses and stunning coastal views, Catalonia is the perfect place to take a golf vacation in Spain. Whether you are planning on a birdie or a hole in one, here are a few worthy suggestions for your next golf holiday in Spain. Located due south of the Catalonian city of Girona, the PGA Catalunya Golf Resort is one of the most well-known in the region; in fact the Stadium Course has been ranked the top golf course in Spain and has achieved top 10 status throughout Europe. The course opened in 1999 and has since become a venue for many of the European PGA tournaments. 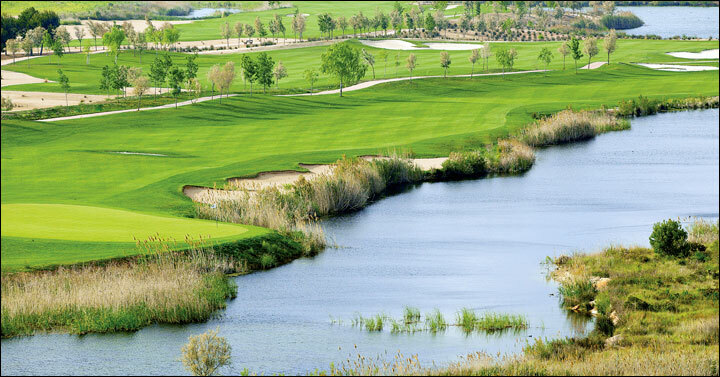 The stunning landscape features tree-lined fairways, hidden bunkers, and tranquil lakes. If you find the Stadium Course too challenging, try the picturesque Tour Course, suitable for all levels and sprinkled with lakes and pine trees. If you like your golf course with a side of sea views, Club Golf D’Aro could be just what you are looking for. With 18 holes, two golf courses, and nine pitch-and-putt holes, there is something for everyone. Located close to the popular Catalan beach resort of Platja D’Aro the course is more than 300 metres above sea level, surrounded by a natural park filled with cork, pine, and olive trees and two artificial lakes. Between holes, admire the spectacular sea views from the fairways before you navigate your buggy to the next tee. This golf course has not two, but three golf courses and 45 holes in total. Situated close to villas on the Costa Dorada, the courses encompass 170 hectares in total. Try to avoid becoming distracted by the sheer abundance of nature, wetlands, archaeological ruins, and the sea views – be aware your score card may suffer! With a backdrop of the Pyrenees, it’s easy to see why Club de Golf Peralada is so popular. This 18-hole, par 71 course is located in the northern Costa Brava in Emporda, a 10-minute drive from the French border. The golf course is competition level and also has a great pitch-and-putt academy that can be enjoyed year round. If you are fortunate enough to be staying in a holiday rental on the Costa Brava, Maresme, or Costa Dorada, there are world-class golf courses right on your doorstep. On your next visit to Catalonia, don’t forget to pack your clubs!